The Berlin Designer Outlet mall is a factory stores shopping center by McArthur Glen on the B5 just outside Berlin. 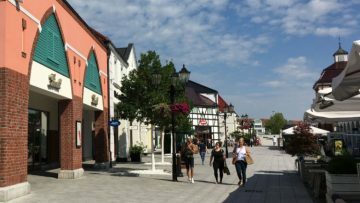 The Designer Outlet Berlin shopping malls is a typical factory stores village operated by MacArthur Glen just to the north of Berlin. Around 90 designer fashion brands offer bargains and savings deal in their own factory outlet stores at the mall including exclusive German upmarket brand names such as Hugo Boss, Liebeskind and Karl Lagerfeld. 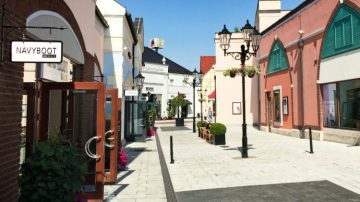 Top non-fashion brands with own factory stores at the outlet mall include Kneipp, WMF, Zwilling, Villeroy & Boch and Lindt. The Designer Outlet Berlin is easily reached from central Berlin by car, VIP Shuttle buses or public transportation. The Designer Outlet Berlin mall has mostly upmarket fashion brand stores from top German and international brands, as well as the usual large selection of major sportswear stores. The mall follows the typical village layout as used by McArthur Glen at many outlet shopping centers in Europe. It creates a pleasant atmosphere but shoppers are of course exposed to the weather between different stores. Squares and plazas are used for special events and exhibitions depending on the season. 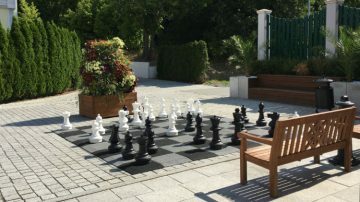 The center also has play areas for children and even a large chess set for adults. Most of the around 90 stores at the mall sell designer fashion brands. Top brands with own factory stores at the Berlin Designer Outlet include amongst others Aigner, Bogner, Brax, Bruno Banani, Calvin Klein, Daniel Hechter, Desigual, Diesel, Escada, Esprit, Falke, Fossil, Gant, Guess, Hugo Boss, Hunkemöller, Joop, Karl Lagerfeld, Levi’s, Liebeskind, Marc O’Polo, Marvelis, Mey, Michael Kors, Napapijri, Navyboot, René Lezard, Replay, Rituals, Scotch & Soda, Skecher, Stefanel, Strellson, Strenesse, Superdry, Tom Tailor, Tommy Hilfiger, Ugg and Wellensteyn. 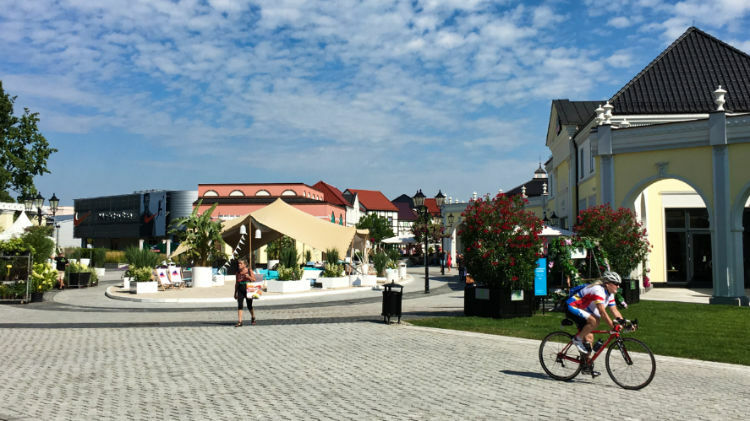 Top sports, outdoor and casual wear shops at the Berlin Designer Outlet mall include Adidas, Asics, Billabong, Columbia, Golfino, Jack Wolfskin, Lacoste, New Balance, Nike, O’Neill, The North Face, Timberland and Under Armour. A few further factory outlet stores are located near the mall but not officially part of the McArthur Glen center. Very good deals are often available here, although the selection and variety may be more limited, on brands such as Gerry Weber, Triumph, Fritz Müller and Schiesser. Non-fashion outlets include high quality kitchen and homeware from Villeroy & Boch, WMF and Zwilling while Home & Cook has a variety of cheaper brands. Möve is particularly famous for its good quality towels while The Body Shop also has a factory outlet shop at the mall. Kneipp sells its famous teddy bears and other high quality children’s toys. Lindt is the only outlet shop with edibles – the deals are particularly good on out of season chocolates, e.g. Christmas decorations in January, hearts in March and Easter eggs in May. Several accessory and sunglass stores operate at the Designer Outlet Berlin including Swarovski, Watch Station and Fossil. Many stores sell bags but Samsonite may come to the rescue for serious shoppers. Nine food outlets are available at the Designer Outlet Berlin with most either fast food outlets or cafés. These include major brands such Marché, Häagen Dazs, Illy and Nordsee. The Kamps bakery is usually a great option for baked snacks. A McDonalds is available across the road from the mall but for more substantial food it is better to head back to Berlin. The factory outlet shops at the Berlin Designer Outlet mall is open Monday to Saturday from 10:00 to 20:00. The mall is closed on most Sundays and vacation days but special longer hours are possible around major holidays. Getting to the Berlin Designer Outlet factory stores mall, Alter Spandauer Weg 1, 14641 Wustermark, is easiest by car from Berlin but public transportation is also possible from Berlin and Potsdam while special shopping express shuttle bus services are also available. The Berlin Designer Outlet mall is directly off the Autobahn B5 around 10 km to the northwest of Berlin. Use the Berlin-Spandau exit on the B5 and follow the “Designer Outlet Berlin” signs – the mall is mostly visible from the autobahn. (From Potsdam and other parts of Brandenburg, use the A10 ring road to the Berlin-Spandau interchange with the B5.) 3,000 free parking spaces are available with the multi-story parking lot closest to the mall changing into Premium Parking (€5) on Saturdays and special events. A VIP Shuttle-Service run twice on Friday and Saturday from Kurfürstendamm 225 / Hard Rock Café (near the Zoologischer Bahnhof in Berlin) to the Designer Outlet Berlin. The service is currently free but advance reservations are essential. Take regional train RE4 (direction) Rathenow from Berlin (e.g. Hauptbahnhof, Potsdamer Platz) to Bahnhof Elstal (around 30 minutes) and then Bus 662 (direction Wustermark, Schule) to bus stop Elstal, Designer-Outlet (one stop or 2 km walk). Total traveling time is around 40 minutes. The bus and train fare is covered by the standard Berlin ABC ticket. Expressbus A05 connects Berlin Zoologischer Garten Station and Elstal (Designer Outlet and Karls Erlebnis-Dorf) via Messe / ICC a few times per day. It requires a €2.50 surcharge on top of the standard Berlin ABC ticket. Traveling time is around 50 minutes. The Designer Outlet Berlin is somewhat surprisingly the only real factory stores shopping center in the Berlin region. Berlin is full of shops and several major shopping centers such as the huge Mall of Berlin with sales particularly good after Christmas and end of season (usually end January / early February and July). The best outlet shops in Germany, including five Hugo Boss stores, are at Metzingen near Stuttgart.